2018 has been another big year for streaming services. Netflix now has hundreds of original TV shows, stand-up specials, documentaries and movies. Amazon has also seen success with its series “The Marvelous Mrs. Maisel,” sweeping the awards show season. Amazon said in a press release that its most viewed shows of the year were “Tom Clancy’s Jack Ryan” and “Homecoming.” The latter is a show based on the popular podcast from Gimlet Media and stars Julia Roberts. Jack Ryan earned John Krasinski a 2019 Golden Globe nod. “Orange is the New Black” was one of Netflix’s first original shows. It’s the only one still running from 2013, the year Netflix debuted its original shows. It will be back for its seventh and final season next year. This controversial comedy focuses on the life of Patty Bladdell, a teenager who was bullied for being overweight. After a dramatic weight loss due to an accident that left her on a liquid diet for three months, Bladdell goes on to seek revenge on her bullies. The show received over 100,000 signatures on Change.org calling for its cancellation due to claims of fat-shaming. 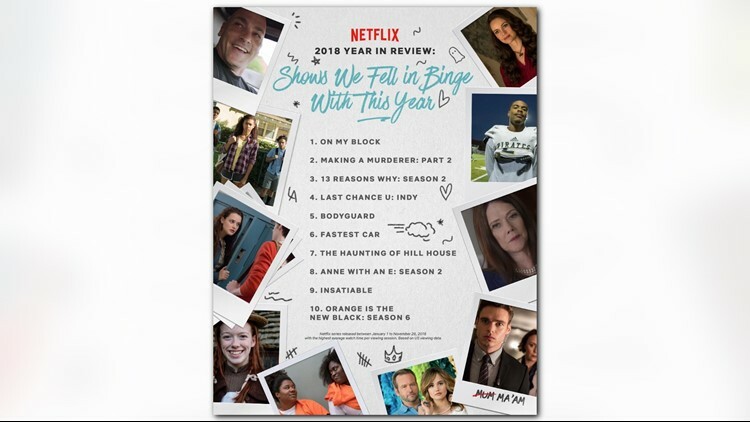 “Anne with an E” also made an appearance on Netflix’s list of popular shows in 2017. It’s based on the classic children’s novel, “Anne of Green Gables,” and stars Amybeth McNulty as the title character. Perhaps the cross-generational appeal of the book is what cements this show on the list. Netflix’s horror series gained a lot of buzz this October, and for good reason. The show is based on Shirley Jackson’s classic novel of the same name and is an expertly blends horror with family drama and mystery. The reality show premiered in April and is the streaming service’s first foray into the automotive genre. The show features three drivers and their cars going head-to-head in drag races. It was renewed for a second season, set to launch some time in 2019. The BBC show aired in August and captivated UK viewers, achieving the highest viewing figures for BBC since 2008. It launched on Netflix in November, where it once again captivated viewers, this time in the U.S. The show focuses on a police sergeant and British Army war veteran with PTSD who now works as a special protection officer. He’s assigned to protect the home secretary, whose politics he despises. The third season of Netflix’s college football documentary focuses on Independence Community College in Kansas. Last season, the show followed East Mississippi Community College, and both seasons include plenty of drama on and off the pitch. The first season of the show used all of its source material, ending when the book of the same name ended, but that didn’t stop season 2 from being a hit. The show picks up five months after the events of the last season, when the trial for Hannah Baker moves to court. Both seasons garnered a lot of controversy for the way it portrayed sensitive topics such as suicide and sexual assault, but the show still saw streaming success. “Making a Murderer” first arrived on Netflix in 2015 and quickly became a cultural phenomenon. It was all anyone could talk about, and it kick-started a wave of true crime series on the streaming service. Part 2 premiered in October and followed Steven Avery and his nephew Brendan Dassey as they appealed their convictions in the murder of 25-year-old Teresa Halbech. The coming of age drama didn’t seem to generate a lot of hype, but it’s received critical acclaim, with a 95 percent on the review website Rotten Tomatoes. The show centers around four inner-city kids, and with only 10 half-hour long episodes, it makes sense that viewers could watch a big chunk of the show in one viewing session.